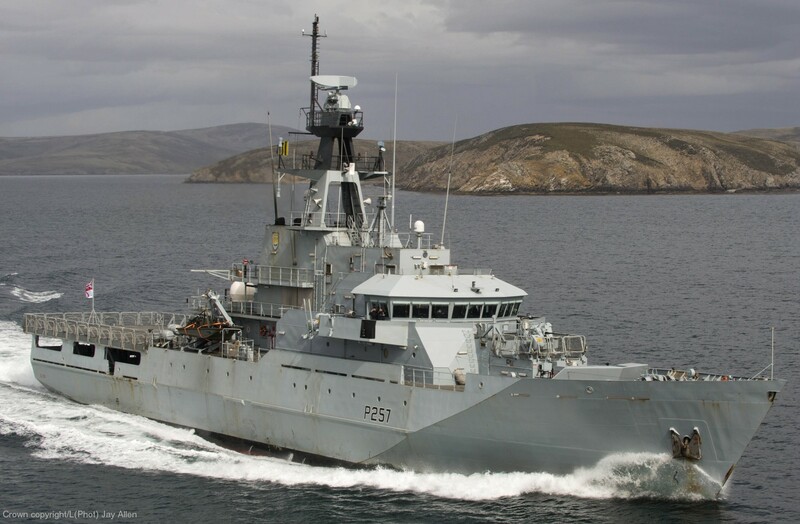 A modified fourth vessel for the Royal Navy, HMS Clyde, was constructed at Portsmouth Dockyard and replaced the two vessels of the Castle-class patrol vessel for duties in the Falkland Islands. This ship displaces 1,850 tonnes and has a 30 mm gun, as well as a deck strengthened for aircraft operations. 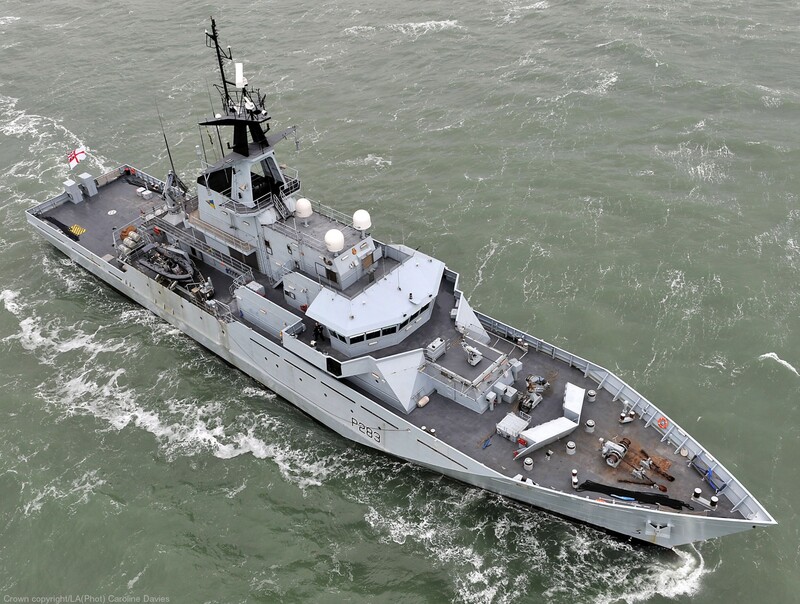 On 6 November 2013 it was announced that the Royal Navy had signed an Agreement in Principle to build three new OPVs -based on the River class design- at a fixed price of £348m including spares and support. In August 2014, BAE Systems signed the £348 million contract to build the three new OPVs on the Clyde in Scotland. These Batch 2 vessels (and the very similar Amazonas and Krabi classes) are fundamentally different in appearance to the preceding Batch 1 ships. Notable differences are that they are around 10m longer, have a different (full width) superstructure, and a fundamentally different above-water hullform shape (greater bow flare, different & less-pronounced forward knuckle line compared to the Batch 1 ships, lack of the distinctive fwd & aft bulwarks of the Batch 1 vessels). 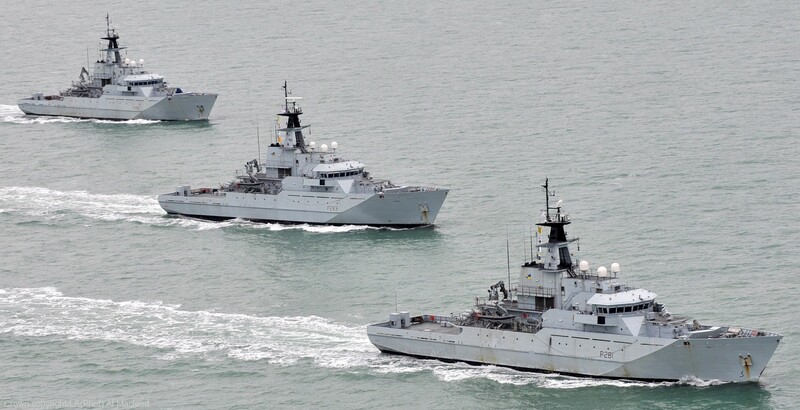 In this regard, the Royal Navy Batch 2 vessels (and their near-sisters of the Amazonas and Krabi classes) arguably represent a distinctly separate class to the Royal Navy Batch 1 vessels. The new Batch 2 vessels will be used for constabulary duties such as "counter-terrorism, counter-piracy and anti-smuggling operations". According to BAE Systems, the vessels are designed to deploy globally, conducting anti-piracy, counter-terrorism and anti-smuggling tasks currently conducted by frigates and destroyers. Steel was cut on 10 October 2014 and they are expected to enter service starting 2017, with the last being delivered by the end of 2018. Similar in design to the Amazonas-class corvette (the Brazilian variant of the BAE offshore patrol vessel), the new ships will incorporate a Merlin-capable flight deck, a top speed of 24 knots (44 km/h; 28 mph), be 90.5 metres (296 ft 11 in) in length and displace around 2,000 tonnes. Initial press reports suggested they would have a range of 6,300 nmi (11,700 km) but more recent MoD publications put them at 5,500 nautical miles (10,200 km; 6,300 mi) like Clyde. They will be fitted with the Kelvin Hughes SharpEye integrated radar system for navigation and Terma Scanter 4100 for surveillance. - lacking a medium calibre gun (76mm+). It is argued that without these features (which could have been incorporated) these vessels represent under-armed and over-priced coastal patrol boats, rather than the Ocean-going Patrol Ships claimed. 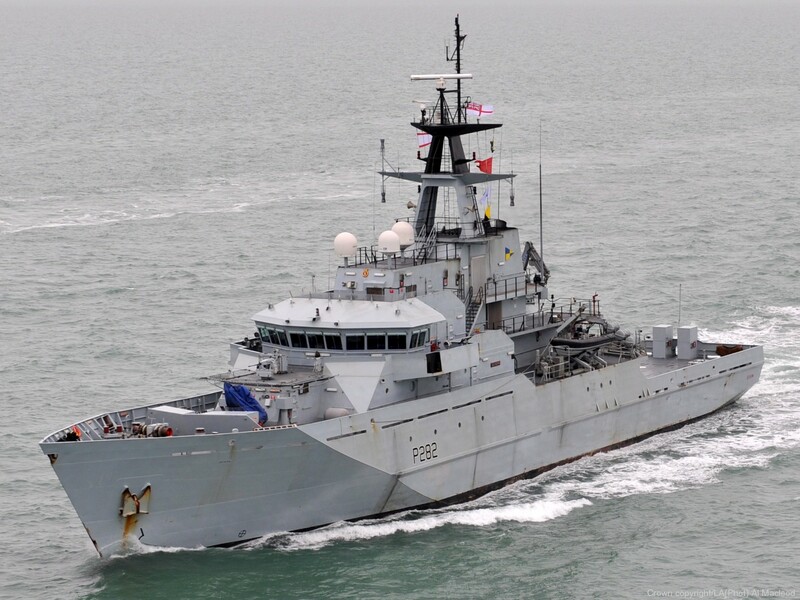 The 2015 UK Strategic Defence and Security Review outlined a future fleet of 'up to six' offshore patrol vessels, with a further purchase of two new vessels at an undisclosed date in the future. This will encompass the three Batch 2 ships, Clyde (which already has a flight deck), and two further River-class OPVs. The three Batch 1 ships without flight decks will be withdrawn in favour of the newer ships. 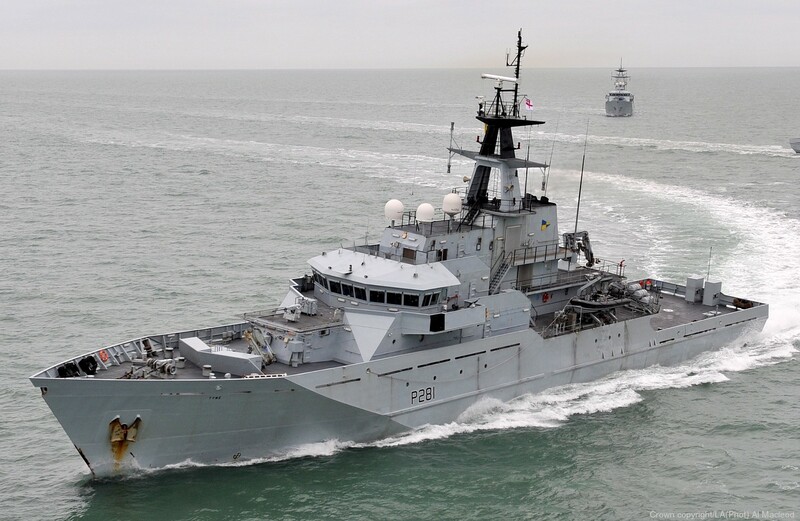 The SDSR also hinted that the OPVs could be used 'increasing the Royal Navy’s ability to defend UK interests at home and abroad, which might suggest a broader range of operations away from the UK.